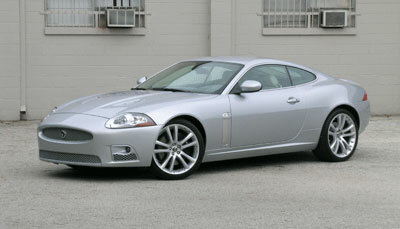 Our 2007 XKR Coupe fully lived up to the old Jag slogan "grace, space and pace," with a lithe body packed full of luxury and a bonnet stuffed with a 4.2-liter, 420-horsepower, supercharged V8. Thanks to its six-speed automatic transmission--locked into sport mode, of course--and some judicious handling of the steering wheel-mounted paddle shifters, it was even more fun than most recent Jaguars. If you haven't noticed, Jaguar has broken with British tradition and embraced technology under Ford's watch. According to Jaguar, our XKR's "fully active exhaust" changes the tone and pitch of the exhaust according to throttle position. Drivers can thrill to V8 rumble and supercharger whine on launch, but enjoy the opulent sound system at cruising speeds. The suspension's active, too, with computer-controlled electronic shock dampening. Of course, all this power, luxury and technology doesn't come cheap. Base price for the XKR is $85,835, and after adding in the $5000 optional 20-inch wheels and a few other options, our test car's final price tag was $97,210. I know I should love this car. It's fast, beautiful and exotic. For some reason, I just didn't warm up to it. I kind of felt a little claustrophobic inside, and from behind the wheel it didn't hide its 3800-pound weight.